"Superclean client and reliable, secure service. A good choice for businesses that want to avoid Web security hassles." "LOVE IT! I was sold on your service from the minute I learned about it. I have told others and they have the same opinion. Your service is easy to use, does what it claims to do and all for a very reasonable price." "I have now been a subscriber for over 2 years. And thank God, as I had a complete hard drive failure on my business computer about 6 months ago. I replaced the hard drive and it was beautiful to see all my data completely restored from FirstBackup!" "FirstBackup is excellent. I switched over from a competitor due to poor customer service and a clumsy interface, and am very happy with FirstBackup. Keep up the good work!" "I lost my hard drive two weeks ago today. Your staff was superb. Everything I saved came back in excellent condition." 1) Review the low subscription pricing and subscribe to the FirstBackup service. 2) Download and install the pre-configured FirstBackup client software. 3) Configure your backup set(s) with the files and folders you want protected. 4) Monitor your backups via log files and automated e-mail alerts. THATS REALLY ALL THERE IS TO IT! First Backup comes fully configured and ready to use. Once downloaded and installed, all you need to do is define a backup schedule with files and folders you want backed-up. It is easy to configure multiple PCs and/or Servers to share one account. The computers do not have to be geographically co-located. You can define separate sub-user accounts and allocate storage for each computer. This enables every computer (sub-user) to have their own login, preferences and configuration - all controlled by and billed to a single administration account. Users can define one or more backup sets to be run automatically at one or multiple times each day. Your initial backup will compress, securely encrypt and backup every selected file to a First Backup secure data center via 448-bit Blowfish encryption. Subsequent backups are performed incrementally - meaning only the changes made to the files are sent to the First Backup server. Incremental backups greatly reduce storage requirements and Internet bandwidth, thus optimizing backup times and server storage space. New Files: Files added to any backup set folder will automatically be sent to the First Backup Server during the next backup. Changed Files: Updated files are backed-up using Incremental binary patching. They are compressed, encrypted via secure 448-bit encryption, transferred and archived for 30 days (user configurable up to 27 years). Deleted Files: When you delete a file on your computer, the file (and it's corresponding versions) remain available on the First Backup Server for 30 days (user configurable up to 27 years). You can immediately delete a file from the First Backup Server via the First Backup Client user interface. Moved Files: When you move a file to a different location on your computer, it is treated as a Deleted File in it’s original location and a New File in the new location. FirstBackup Professional automatically backs up all open, locked and in-use files including those opened for “exclusive access”, i.e., Outlook, Quickbooks, RDMS databases, etc. You’ll never have to log out or close a program at backup time again. Most backup services support VSS (MS volume shadow copy service). However, VSS is only compatible with the latest Windows OSs (like XP and 2003) and is NOT compatible with most client/server applications, legacy systems or some mainstream applications. It can also conflict with various LAN based backup programs, which is a major consideration for many users. FirstBackup Professional’s open file technology is compatible with all modern Windows OSs. We support virtually all applications too. Further, we allow you to back up open files across mapped drives and network shares - a service level that our competitors simply don’t support. Many businesses utilize QuickBooks to manage their critical financial data. FirstBackup Professional's Open File Backups make it easy to backup QuickBooks and QuickBooks Pro without having to close the application. Simply include the .qbw (QuickBooks work file) in one of your backup sets. (Note: FirstBackup Classic customers must close QuickBooks prior to backing up the .qbw file, or use QuickBook's backup and recover facility to create a .qbb file for backup). Simply select System State in any backup set and FirstBackup Professional will back up your Windows System State (Windows registry, user settings, and Windows system files). FirstBackup Professional will automatically detect and backup Live SQL Server at the bit-level – without having to stop the critical services that support your business. FirstBackup users have two great options for Exchange Server backups and restores. For disaster recovery, FirstBackup Classic is great. Simply select the Exchange server and Classic is setup to backup and restore Exchange. It efficiently sends only the bit-level changes of the full Exchange store to the backup server. While Classic can not restore a single email or folder, you can restore Exchange to another server, extract what you want, then import it into the production server. If you want to be able to restore down to the folder/email level, FirstBackup Professional is for you. Note that while handy, this level of granularity increases setup requirements and backups/restores can be less efficient. Regardless of which FirstBackup solution you use for Exchange, you will want to make sure you backup Active Directory. Our support team is available to assist you with FirstBackup service selection and configuration of your Exchange, Active Directory, SQL, etc backups. If Active Directory is installed, FirstBackup Professional will automatically detect it and enable it to be selected for backup. FirstBackup Professional provides users with a local backup store configurable to any local or network drive. A restore request will intelligently attempt to restore from the local store first. If the file(s) can not be restored from the local store, FirstBackup will retreive the file(s) from the FirstBackup datacenter. This methodology greatly improves performace, optimizes bandwidth, and provides yet another layer of redundancy protection for your critical data. 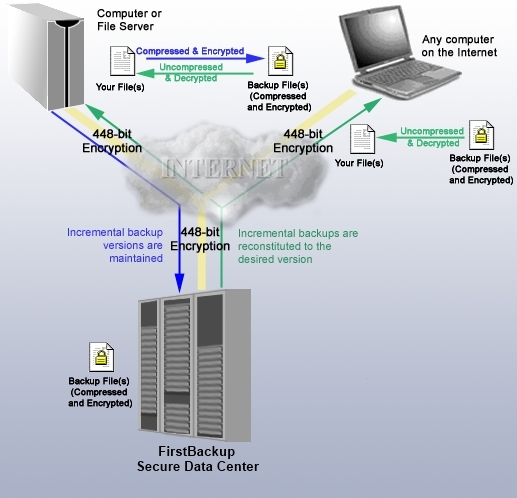 FirstBackup Professional supports onsite backups to CD/DVD media. The encrypted media can be safely stored or transported to our Data Center and copied onto the Backup Server to optimize large volume initial online backups. By default, First Backup maintains the last 30 days of file versions on the First Backup server (user configurable up to 27 years). Users can configure the First Backup Professional client to automatically purge (delete) any backups on the First Backup server older than “#” days. Users can restore any available file version(s) from the First Backup server via the FirstBackup user interface. Simply select the appropriate folder(s) and/or file(s) and click the "Restore“ button. Upon request, each file is automatically combined with the appropriate incremental backups, securely transfered to your computer, decrypted, uncompressed and restored to its original (or optionally temporary) location. Your files are encrypted and stored at multiple, redundant First Backup secure data centers. Even if a fire, flood, or other disaster destroyed one of our data centers, your data remains protected and available, on-demand - 24x7x365. First Backup utilizes the industry's strongest and fastest encryption algorithm for the ultimate in data security and protection. Blowfish is a symmetric block cipher accepting a variable-length key up to 448 bits, making it ideal for both domestic and exportable use. Since it's initial release in 1993, the Blowfish code has never been cracked. In fact, a 448-bit Blowfish encryption key would take 2.1x1096 BILLION powerful computers, each capable of trying one BILLION keys per second to try every possible combination of bits in a 448-bit key. In other words, your data is ultra-secure with First Backup. When you subscribe to First Backup, you will select a username and password for the my.firstbackup.com account administration site. By default, First Backup Classic utilizes this password as your encryption key. If you ever forget this password/key, we can e-mail it to you. For ultimate security, FirstBackup Classic users can define a Secret Encryption Key. FirstBackup Professional requires Secret Encryption Keys (see below). Maximize your data security by setting a Secret Encryption Key to encrypt and decrypt your files. Your Secret Key is stored on your computer and you are the ONLY one who knows it. For security purposes, we do not store it on our servers, nor do we keep a record of it. We Can Not Access Your Files. Since you are the only one who knows your secret key, please write it down and keep it in a secure place. If your secret encryption key is ever lost, you will not be able to access or recover any of your backup files. All communications between your computers and the First Backup secure Data Centers are protected by SSL and/or 448-bit encryption. This secure communications is utilized for username and password authentication as well as the transportation of your data files, ensuring that no one will ever be able to get to your data. FirstBackup Professional adds user interface password protection to prevent unwanted access in a shared computing environment. First Backup combines the highest security and functionality with the absolute lowest pricing in the industry. Our Annual Subscription service automatically and securely protects your data year-round. Corporate and multiple-computer users will appreciate our value packed, cost effective programs. Upgrade to FirstBackup Professional Today!